Why the name Bangui (Capital of Centrafrique)? Today, I will be talking about Bangui, the capital of Centrafrique or the Central African Republic (CAR). Bangui is commonly known to locals as “Bangui, la coquette“, or “Bangui, the coquette“. Before its independence on August 13 1960, Centrafrique was known as “Oubangui-Chari” (in English: Ubangi-Chari) because its border in the south is formed by the rivers Oubangui (which is the border with the democratic republic of Congo) and Mbomou, while at its northern border is the Chari river which also runs into Chad. When the French first colonized the area in the 19th century, they adopted the name Oubangui-Chari, since the country is located in the Oubangui-Chari basin. Thus the city Bangui is located on the right bank of the Oubangui river. The city was started (I will not use the more common word ‘founded’ as I disagree with its use here) on 26 June 1889 during French colonization, to serve as a base for French expansion in Central Africa. 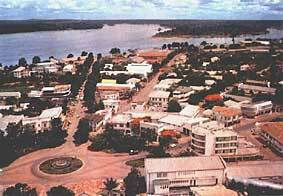 At its creation, it was part of the then French colony of Haut-Oubangui (Upper-Ubangi). The city grew thanks to its proximity to a French military post (which still exists there today), and became the center of the French colonial administration in the area. At first, from 1889 to 1912, the population was mostly centered near the river Oubangui; later on, it grew on the northern side. It is also good to mention that the city-center is dominated by the Gbazabangui hills, inside which there is a special forest reserve.